1.5. You agree, understand and consent, in the form prescribed hereto, that the Healthcare Provider may upload and share with You your medical documents such as prescriptions, images and reports etc, through the Nokdok Platform and the medical documents will be accessible to You and You may retain it on the Nokdok Platform for future use and easy access or may remove the document from the Nokdok Platform at your discretion. f. Any other information that you may voluntarily choose to provide at your discretion. 2.2 The information collected by Nokdok may at times constitute ‘Personal Information’ or ‘Sensitive Personal Information’ under the SPI Rules. As per the SPI Rules, Personal Information means any information that relates to a natural person, which, either directly or indirectly, in combination with other information available or likely to be available with a body corporate, is capable of identifying such person. 2.4	Information that is freely available in the public domain or accessible under the Right to Information Act, 2005 or any other law will not be regarded as Personal Information or Sensitive Personal Data or Information. a. Provide You with the services and information that you request from us. b. To respond to Your correspondences. c. To notify You with other services you might be interested in. d. Contact You when required or when asked for, including to remind You of an impending appointment. e. Customise Your services which might include customised messages, personal calls or other information that might be of your interest as per the information collected by you. f. For internal review in terms to provide better Services, understand Your feedback, or otherwise at Our discretion in ways not restricted by applicable laws in force. g. Use information collected statistically as permitted by law, including from third parties in connection with the commercial and marketing efforts, subject to there being no breach of the contract between the User and Nokdok. h. Prevent, detect and investigate security breaches and potentially illegal or prohibited activities. 3.2 You are responsible for maintaining the accuracy of the information You submit to us, such as Your contact information provided. If Your Personal Information changes, You may correct, delete or amend the same. 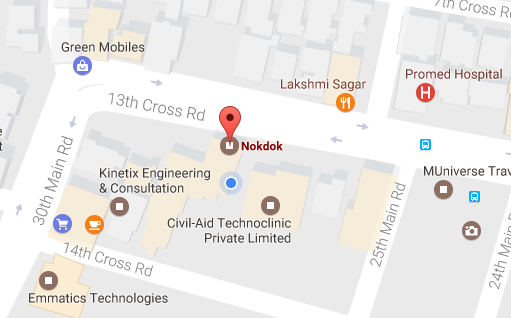 The same may be intimated to Us at administrator@nokdok.com or 205 Emabassy Center, Nariman Point, Mumbai, India 400021. Nokdok shall make efforts to make the required changes as soon as possible. 3.3 Nokdok is not liable for any inaccurate Information provided by You. If it becomes known that You have provided inaccurate or incomplete Information, Nokdok reserves the right to discontinue providing Services to You at its sole discretion. 3.4 Nokdok shall not retain any Information longer than required for the purposes for which the Information may lawfully be used or is otherwise required under any other law for the time being in force. 3.5 Nokdok may use Your Information for in-house analytical purposes to evaluate Services provided by it. 3.6 Nokdok may require the User to pay with credit card, wire transfer, debit card or cheque for Services for which subscription amount(s) is/are payable. Nokdok may collect such User’s credit card number and/or other financial institution information such as bank account numbers and will use that information for the billing and payment processes, including but not limited to the use and disclosure of such credit card number and information to third parties as necessary to complete such billing operation. 3.7 Verification of credit information, however, is accomplished solely by the User through the authentication process. User’s credit-card/debit card details are transacted upon secure sites of approved payment gateways which are digitally under encryption, thereby providing the highest possible degree of care as per current technology. Though an option to save your payment details is provided Nokdok advises the User to exercise discretion and shall in no way be held liable if the User opts to save his details on such payment gateways. 5.1 Nokdok places the security of Your Information as high priority. We endeavour to follow the generally accepted industry standards to protect the Information given to Us, both during transmission and in storage. 6.1.1 You are at all times in control of your Information. Nokdok does not edit, alter or change the Information provided by You in any way. It is Your sole discretion as to what information shall be public, save and except the ones already declared by Nokdok. 6.1.2 If at any time You decide to change the settings of the Information provided by You from Public to Private, Nokdok does not assume any responsibility for misuse of such Information collected, while the Information was still public. Nokdok only undertakes responsibility to protect the privacy of the information which are considered Sensitive Personal Information as per applicable laws. 6.1.3 Nokdok reserves the right to retain Information from the Users accounts, including but not limited to comply with law, prevent fraud, resolve disputes, enforce the Agreement and to take other actions as permitted by law. 6.1.4 It is Your sole responsibility to notify Nokdok in case of any of Your data is lost, stolen or used without permission.